Well!! What is an Electrical Invoice? An electrical invoice is nothing, but a detailed payment statement sent to the client or company by the electrical company or the material provider for the electrical materials sent and service provided to the customer. This will contain the details of the services, material spent and the total cost including the labor. If you are an electrical material provider or work contractor or a person who owns an electrical shop or related to any kind of electrical service and looking in different forums for various invoices templates to bill your clients according to the service you provide? Then you can be happy as your search is already over and you can get all kinds of electrical related invoices here at one place, that too without spending even a single penny. Wondering how? It is very simple, all you have to do is to just choose the template you require from the most wonderful set of electrical invoice templates designed by our team and download it and start using it instantly for free. You can also customize these and create your own templates. 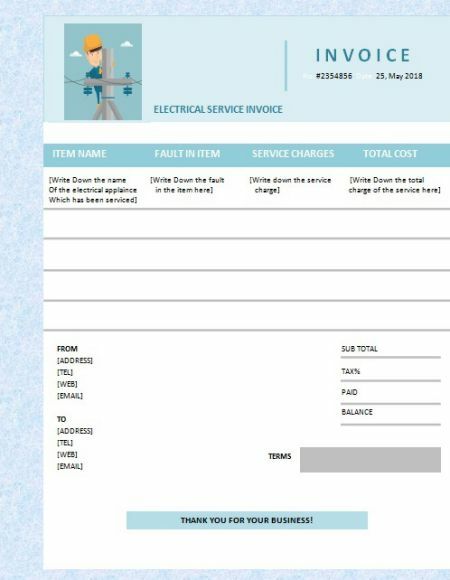 Having given a brief intro of what is Electrical Invoice template, we shall now look in to the various electrical based invoice templates, their structure, components and how to design an electrical Invoice Template and use. Customer Details – You can mention the name, address and contact information of the company or an individual to who you are sending your Electrical Invoice statement. Work Description – Include the detailed description of the work performed including the materials purchased, service or labor involved to complete the work. Amount Involved – Ensure to include the charges for all the electrical works performed with material and labor charges. Finally sum up everything towards to bottom of the invoice. It is also important to include the tax, if applicable depending on the place. Date – this is the date on which your invoice is sent. Terms and conditions – Ensure to include the terms and conditions of your company and service in the Invoice for the client to be aware of all the terms and make payment accordingly. We shall discuss about the various terms and conditions that needs to be included in the next section. Mentioned above are the common parts that needs to be included as part of an electrical Invoice template. 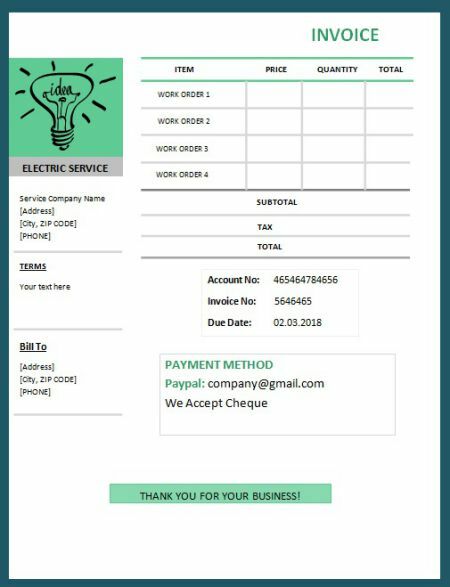 For you to use right away we have presented the simple and easily adorable set of electrical Invoice Templates designed by our team. You can just click on it and download within seconds and use it as per your requirement. These free printable certificates are in the editable format and which will let you create your own templates and enjoy using it to bill your clients. Mentioned here are some of the samples that needs to be added as part of your terms and conditions. And these are purely company specific and subject to changes depending on the company terms. You can create your own terms as per your requirement and always consider the above conditions for a smooth and easy deal. Work order is a job that is proposed by the customer and given below are the important factors that needs to be considered when you send an invoice to the customer for the electrical work performed. Work order number – Mention the Job or task order number. Invoice Number – Mention the invoice number that will be sent to the client for payment and used for accounting purposes. Service Provider Details – Details for the company who is providing the electrical service, their location, address, contact information and other details about the company. These are the basic details that needs to be include in an electrical work order Invoice sent. We have designed such work order templates and given here for your perusal. It is all in the ready to use form and you can use it instantly for free. These free printable templates can be downloaded and modified according to your requirement and used at any time. When a customer or client approaches your company for any electrical work, they have to be addressed with the service and provided with the Invoice with all the details included in it. Now we shall look into the details of items that needs to be included as part of Electrical Contractor Invoice. As mentioned in the above formats all invoices will be including the name of the company, address, contact information and logo if any. Along with these information about the customer can also be mentioned. Then describe the materials, quantity of materials, labor involvement, hours of work, taxes and total of all these cost. A separate section can be included to add the descriptions of work that is going to be performed and the material and labor details. Parts for the customer to sign and agree with the contract and most importantly space to include the terms and conditions of your company. 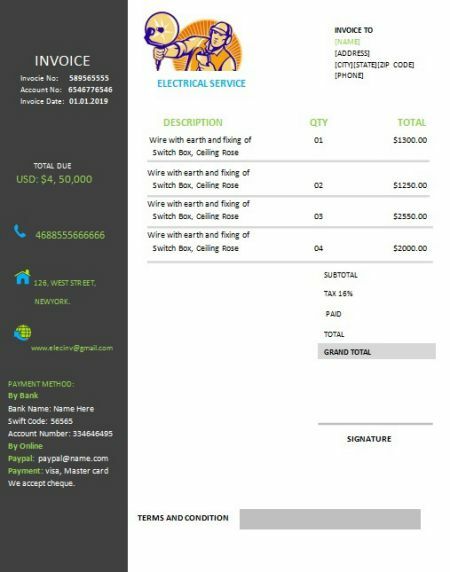 If you own an electrical shop and would like to bill your customers effectively with the help of excel then here are the sample and guidelines for you. You can have separate sections for all the details in a properly aligned format with the help of excel. This will also help you to keep track of all your bills. Include the name of your shop on the top with center aligned and bold along with the address and contact details. Next you can provide the space to write the customer name, whereas the customer address and contact information are optional in this place. Then you can have the details of the electrical materials purchased and the unit price and total price against each column and finally the grand total of all the materials purchased. And terms of returning good in case of any damage identified post purchase. Thus like mentioned above you can create these simple and easy electrical shop bills. We have created those formats and presented here for your use. These are free to use and in the editable format. 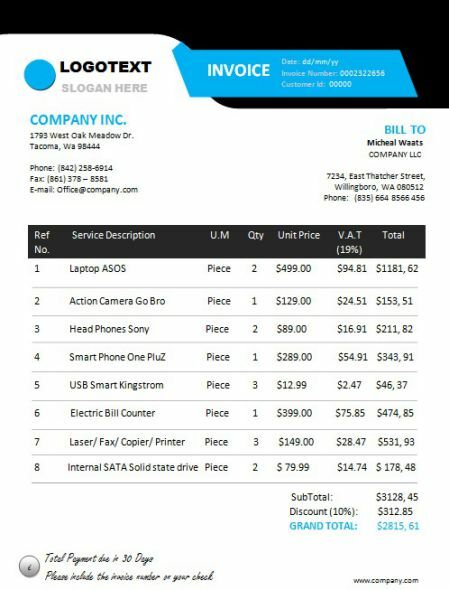 You can download these and like any other invoice templates in our page you can edit this also but an added advantage is that you can do it in excel as well. Electrical quotation template is used to show the clients/customer on the material used and the charges applicable based on the kind of work request from the customer. You can mention the company details in the template as always. But unlike the other templates it is not mandatory to mention the customer details in the template as it is only the quotation for the work and not an invoice or agreement statement. But the major part of electrical quote template is the description of the material and the cost for it. It is very important to mention the type of materials that will be required for the work, in case of un-availability what are the alternative materials that can be used, total pricing of that all needs to be mentioned clearly in the quotation. These are very simple and common templates that can be used for any kind of quotation works. These are easy and straight forward that can be used without any changes. But as always if required these can be edited as per your requirement. These templates are in specific to the electrical wiring works and the materials purchased for that purpose. Like other billing formats these should also contain the Name of the shop or company, address and the contact details, Customer name and information, detailed description of the electrical wiring materials purchased and their cost along with the wear and tear conditions mentioned in the bill. These electrical wiring billing format are designed in a professional way by our team and presented in this page for you to consider. You can always make use of these template at any time by just downloading it for free. Being a small and simple file it is very easy for you to download even in your mobile and use it as required. You are always free to modify and make changes to create your own formats and use. 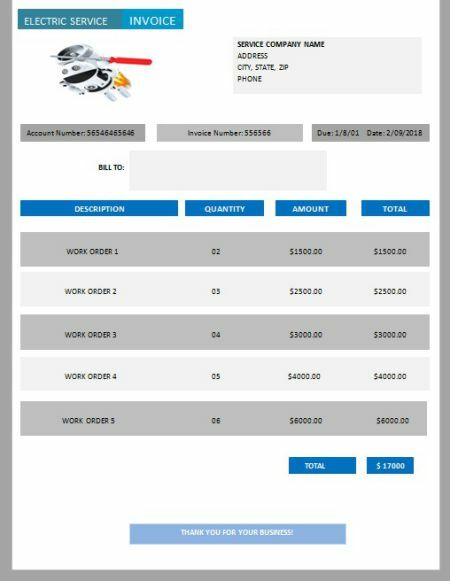 Electrical subcontractor invoice template is almost similar to contractor invoice. But in addition to the contractor details and the terms, even the sub-contractor details and the terms needs to be included in the contract. Unlike other services, electrical services are something that needs to be taken utmost attention and care as it involves many factors for consideration and hence it is very important to make the right person, material and labor involved to complete the work and long run of the service completed. Terms and condition of any company plays a major role in avoiding future disputes between the parties. Being transparent in all the terms and conditions related to work is very important. This will help in having a smooth deal between both the parties. Now we shall have a look into various terms and conditions that needs to be included as part of any electrical contracted invoice. Delivery time – Include the time with in which the GOODS will be delivered in case of material purchase, terms of cancellation of the order, refund terms on cancellation, claim terms in case of material damage. The same will be applicable in case of labor involved and the mention any additional terms pertaining tot the company. Work Schedule – Indicate the time with in with the work will be completed considering all possible circumstances, requirement of additional GOODS during the time of work, consider the labor involvement. Cost Adjustment – Include the conditions of cost adjustment applicable when the work is not completed within the stipulated time. Extension of Time – Specify the terms included for extension of work due to unavoidable circumstance like strike, fire, explosion, delays due to other company or person etc and create a new contract or continue with the existing one. Materials, Details and Dimensions – Include all materials required in detail before starting the contract. All the equipment’s necessary the details and dimensions of the building to perform the electrical work needs to be agreed by the client in the contract terms. Inspection – Ensure to include the testing of all GOODS from the suppliers are performed as per the norms which shall be tested by the contracts and rejected if not met the requirements. Extra Underground Services – Mention involvement of any extra clearance work and how it will be performed. For example if any machinery works needs to be performed manually which will increase the time of completion and money, then the same needs to include in the terms. Warranties – Most importantly warranty for all the electrical work performed and the electrical materials purchased and installed needs to be included. In case of any damage with in the warranty time the same needs to be repaired or replaced as per the contract. Creating a right invoice is just not an easy job and it involves a lot of time. But we are here to make your work easy and simple by providing the electrical subcontractor invoice templates for free and guess what you can also create one of your own from here. 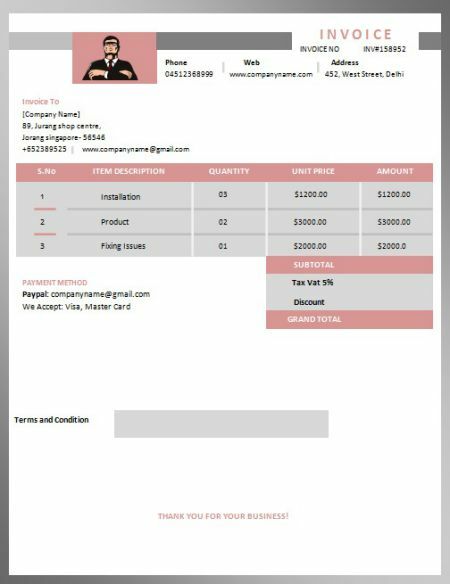 Wondering how, it is very simple, just download these editable templates from our page and customize these templates according to your need and now you are ready with your own template which you can use and enjoy billing your customer.